New location, new design: Chlorosphere sets the stage for JDC 2015 ! 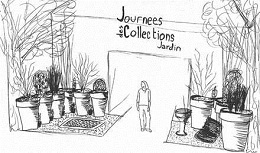 On this year’s “Journée des Collections Jardin” fair in Marseille on 7th, 8th and 9th of April, Chlorosphere will be once again designing the entry garden scene and the Trends Area, setting the stage for the products competing in the race for the LSA Trophies 2015. After the impressive jungle-themed garden with the giraffe made of red resin from 2014, the Chlorosphere team will be presenting a whole new concept and ambience for our upcoming edition. This year, it will be all about soft colors, suggesting femininity and subtlety.